A 4-year-old girl presented to the emergency with right lower abdominal pain and fever since 4 days. Vitals of the child were stable. Abdominal examination revealed distension, rebound tenderness at Mc Burney's point and an ill-defined mass in the right iliac fossa. 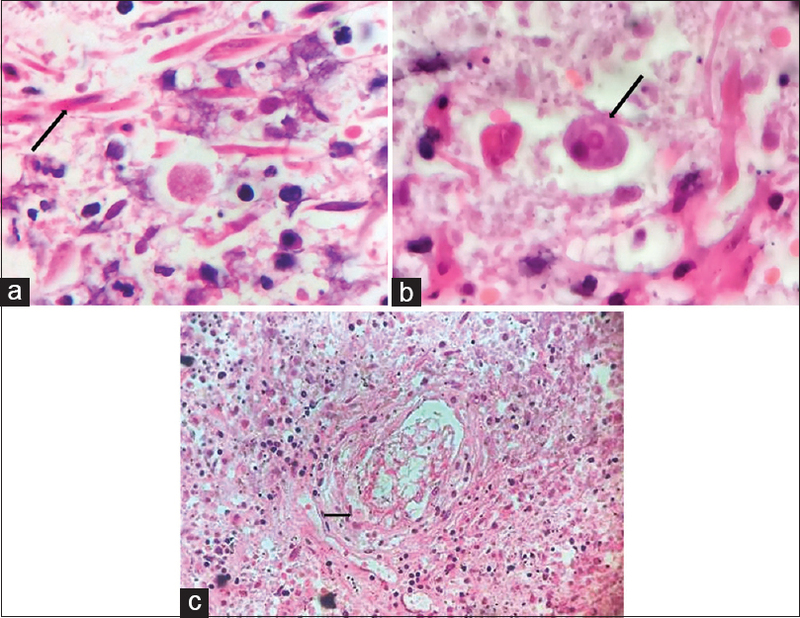 Laboratory investigations revealed neutrophilic leukocytosis with raised C-reactive protein levels. Abdominal ultrasound was suggestive of acute appendicitis with probe tenderness. The patient underwent laparoscopic appendicectomy. 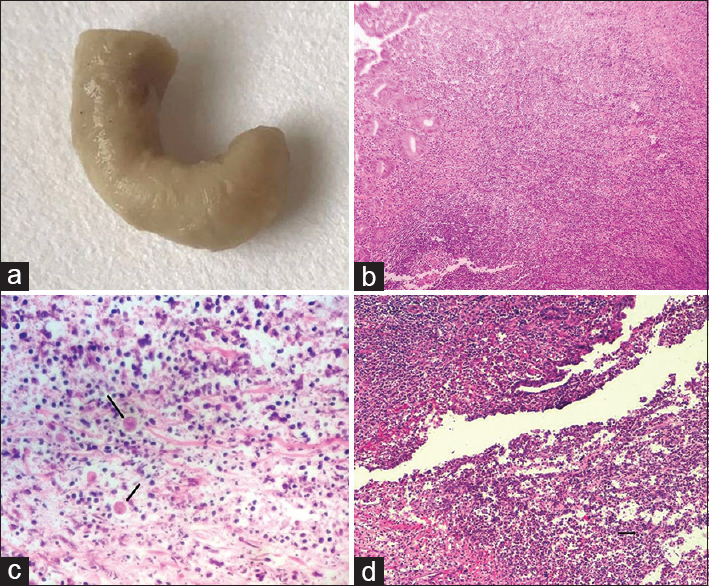 Grossly, the appendix was gray-white, pale, edematous, and friable [Figure 1]a. Histopathological examination showed mucosal ulceration along with extensive areas of transmural inflammation and focal enzymatic necrosis with nuclear debri [Figure 1]b, [Figure 1]c, [Figure 1]d. Numerous trophozoites of Entamoeba histolytica were seen within the lumen as well as invading the muscular layer of the appendix [Figure 2]a. Many of these showed erythrophagocytosis [Figure 2]b. At places, the trophozoites were seen infiltrating into the small vessels as well [Figure 2]c. Periodic acid–Schiff stain highlighted the trophozoites. The child was kept on follow-up and the stool examination done after a course of metronidazole was negative. Appendicular involvement is considered a particularly rare form of amoebiasis with a higher incidence in tropical countries. The reported incidence of trophozoites of E. histolytica in appendicectomy specimens varies from 0.5% (India) to 2.3% (Mexico)., On literature review, reported mean age is 23.5 years with fewer than five cases in children (<12 years) till date. The exact cause of inciting appendicitis in parasitic infestations is not clear because the vast majority of these cases (80%) are asymptomatic in endemic regions. Presumably, the luminal obstruction might be attributed to the presence of amoebae or intense mucosal edema caused by invading trophozoites. Invasion of E. histolytica into the wall of the appendix is required rather than the mere presence in the lumen, to diagnose true amoebic appendicitis. However, in our case, the appendix showed mucosal ulcers along with areas of transmural necrosis. The trophozoites were seen invading the muscularis and blood vessels within the appendicular wall. Except histopathology, there are no reliable radiological or laboratory tests which can confirm the tissue invasive disease. The stool analysis is also not useful in endemic areas as it cannot differentiate between amoebic colitis and carriers. It is imperative to diagnose amoebic appendicitis. Complications such as perforation, liver abscess, abdominal sepsis, fulminant colitis, and colonic fistulae have been reported more commonly in amoebic appendicitis (25.4%–30.7%) as compared to nonamoebic appendicitis (1%–5%). The postoperative treatment needs a prompt addition of metronidazole and follow-up for amoebiasis-related complications. The index case also highlights the importance of routine histopathological examination in all appendicectomy cases as the clinical diagnosis is seldom suspected. Gupta SC, Gupta AK, Keswani NK, Singh PA, Tripathi AK, Krishna V, et al. Pathology of tropical appendicitis. J Clin Pathol 1989;42:1169-72. Hedya MS, Nasr MM, Ezzat H, Hamdy HM, Hassan AM, Hammam O, et al. Histopathological findings in appendectomy specimens: A retrospective clinicopathological analysis. J Egypt Soc Parasitol 2012;42:157-64. Otan E, Akbulut S, Kayaalp C. Amebic acute appendicitis: Systematic review of 174 cases. World J Surg 2013;37:2061-73. Pervez S, Raza AN. A child with acute appendicitis. Eur J Pediatr 2008;167:127-8.